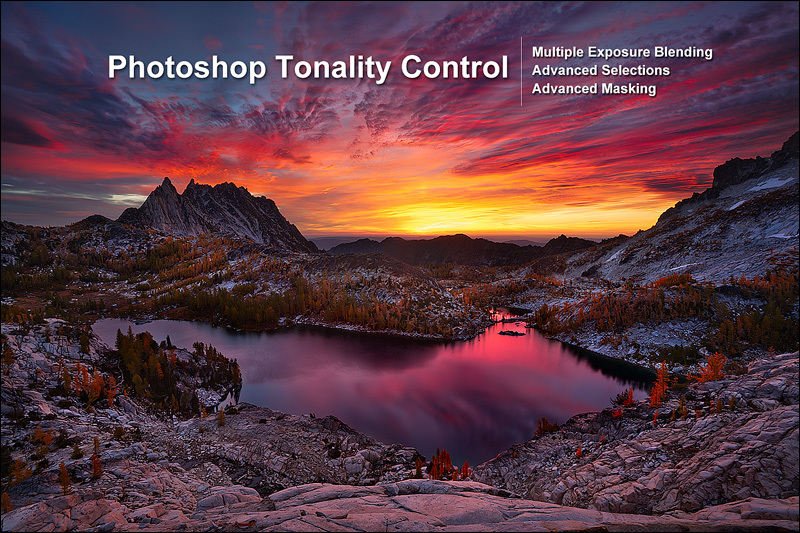 Tonality Control 2.0 is a comprehensive workflow video. I will guide you through my most current multiple exposure workflow; I work on the same image throughout the entire video, except for a short example at the end. I will illustrate how I use the powerful tools and techniques available in Photoshop along with the TKActions V4 Panel to control tonality throughout my entire processing workflow. These techniques are quite advanced, and can be challenging, but they yield incredible results that are not possible with HDR software. I'll demonstrate how I take 3 raw files from pre-visualization to fully realized master file. Includes: 25 chapters, covering 4 hours of instruction. I've also included the raw files used for the project image you see below. This way you can follow along with the same files I'm using in the video. These files are for practice only, they may not be reproduced or sold in any form. Recommended: This video is not intended for Photoshop beginners. You will need to be familiar with the basic tools in Photoshop as well as masks, adjustment layers and basic selections. All of the processing is done within Photoshop and Lightroom as well as the TKActions V4 Panel within Photoshop. This video is not compatible with Photoshop Elements. Video tutorial files are delivered via secure web download. These are large files, it may take several minutes to download, or it may take a few hours depending on your broadband connection and server traffic. It comes in 2 parts: part 1 is just under 1 gigabyte, part 2 is also just under 1 gigabyte. 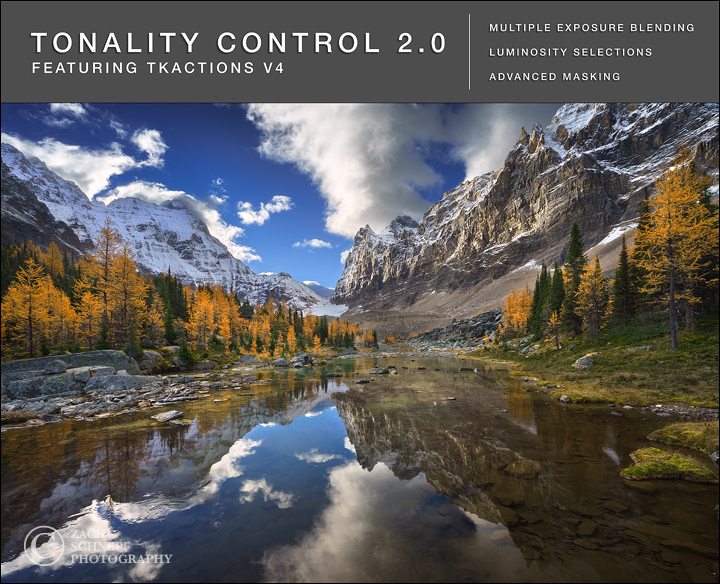 You can see the intro here on Youtube: Tonality Control 2.0 Intro Video. You can also see an excerpt from the video on Youtube here: Tonality Control 2.0 Excerpt. In this video I will guide you through my own multiple exposure workflow. I will illustrate how I use these powerful tools and techniques to control tonality throughout my entire processing workflow. These techniques are quite advanced, and can be challenging, but they yield incredible results that are not possible with HDR software. I'll demonstrate how I take 4 raw files from pre-visulization to fully realized master file. Techniques covered: Multiple Exposure Blending, luminosity selections and masks, refined selections, advanced selection building, image repair and cloning, advanced burning, freehand masking and more. Included: 9 chapters, covering 3 hours, 40 minutes of content. I've also included the 4 raw files used for the project image you see below. These files are for practice only, they may not be reproduced or sold in any form. Required: This video is not intended for Photoshop beginners. You will need to be familiar with the basic tools in Photoshop as well as masks, adjustment layers and basic selections. All of the processing is done within Photoshop and Adobe Camera Raw. My workflow is based in CS5, but almost all of the techniques are compatible with previous versions of Photoshop. This is not compatible with Photoshop Elements. Video Players: This video will look quite different in the Quicktime player compared to other players like WMP, or VLC. In the Quicktime player it will look the most accurate, but it shows up little desaturated and has slightly less contrast than the original. In other players like VLC, the video will show up over saturated and with a little extra contrast. You can choose which which you prefer. Video tutorial files are delivered via secure web download. These are large files, it may take 30 minutes to download, or it may take a few hours depending on your broadband connection and server traffic. It comes in 2 parts: part 1 is 1.26 gigs, part 2 is 1.1 gigs. For more information on Luminosity masks and selections visit Tony Kuyper's site, he has some great write ups on luminosity masks and has downloadable actions he sells on there as well. Click here to visit Tony Kuyper Photography.